As crazy as it sounds, we haven’t seen Dr. Evil — the iconic villain that Mike Myers created for his Austin Powers movies — since 2002 — aka, the year Goldmember came out. While there have been talks of a fourth film for years, Myers has never officially confirmed. So he may have been testing the waters by donning the bald cap once again in a special appearance on The Tonight Show with Jimmy Fallon. After being introduced by Fallon as the most recent person to have been fired from the White House (LOL), Dr. Evil provided some intel as to what’s going on inside the building. Describing himself as an “ideas guy,” he took credit for the wall (but said that he wanted to have a moat of spiky blowfish) and planned on making Alec Baldwin, who famously portrays Trump on Saturday Night Live, pay for it. Dr. Evil also managed to plug Wayfair and discuss “creepy AF” Don Jr. And now that he’s out of the White House, Dr. Evil says he’ll be promoting his new book…which sounds an awful lot like Fire and Fury by Michael Wolff. Just watching this segment makes us want to have a full-on Austin Powers marathon this weekend. We didn’t realize how much we missed him until now. Hopefully Mr. Bigglesworth is still keeping him company. In the end, Dr. 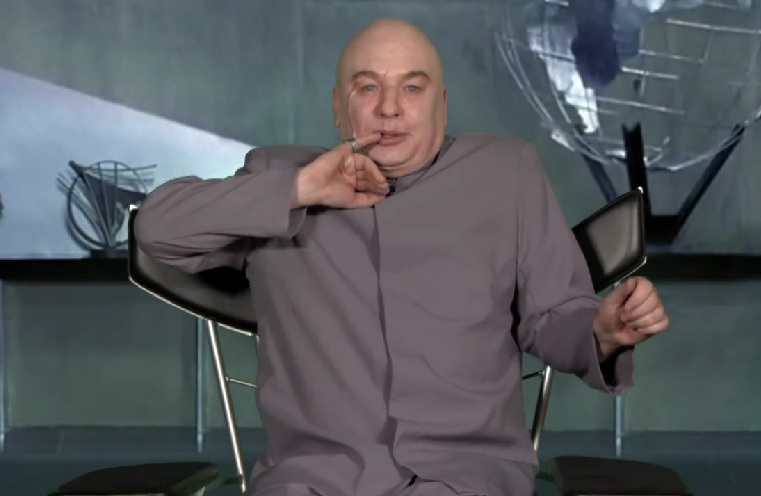 Evil mentions that he’ll be running for president, and, um, we think that would be an amazing plot of a potential Austin Powers 4. Perhaps Austin Powers would have to come out of retirement? Maybe he’d be the unlikely vice president, just in case Mark Zuckerberg isn’t available? There’s a lot to work with here, guys.